Learn their story, and how you can help. Overnight, Theresa, a 28-year-old pediatric oncology nurse, became a mother to three: Annabelle, 9, Michaela, 7, and Oliver, 3. It was a daunting proposition, but she couldn’t stand by and watch the lives of her sister’s kids destroyed by domestic violence. Theresa and her church small group prayed and worked their way through a tangled legal system that eventually granted her emergency custody of the kids. And, ultimately, both her sister and her brother-in-law surrendered parental custody. Even though Theresa won the kids, she knew it would be a long journey repairing the emotional wounds, especially as a single mother. “Their trust had been shattered,” she says. The girls are now Kairos Kids at Hope Reins. 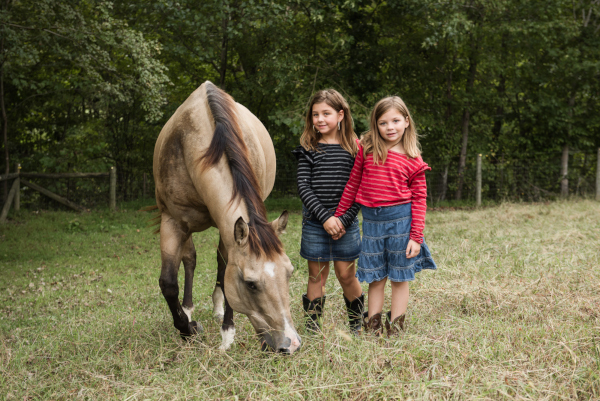 They’ve discovered the simple love, understanding and acceptance that comes from forming a relationship with a horse. According to Karen, one of their session leaders, they’ve been able to channel anxiety into purposeful activities and learn to regulate their emotions by being “present” with the horses. Will you help us sponsor 100 Kairos Kids on our waiting list with stories like Annabelle and Michaela’s? Visit www.hopereins.org/kairos to learn how you can give hope this holiday season. Would you consider making a donation towards Kairos Kids like Annabelle and Michaela?